The medical service of civil defense (MSHA) - an organization created in peacetime, on the basis of all organs and institutions of public health regardless of affiliation on administrative-territorial and industrial principles, intended for realization of the complex of special events on medical support of the population under the threat of an armed attack of the opponent and to the emergence of mass sanitary losses. MGO is part of the civil defence of the country (Federal Republic, region, district, city, object), which is a system of national defence measures aimed at protecting the population from the effects of mass destruction, to ensure sustainability of the national economy in a time of war and for liquidation of consequences of the use by the enemy of weapons of mass destruction. The direct management of civil defence in the center and locally conducted by relevant bodies of the Soviet authority. The main tasks of MGO are timely provision of all kinds of medical aid in various pockets of mass destruction to reduce mortality and quick recovery of their health and work capacity, prevention of emergence and spread of infectious diseases, the provision of sanitary well-being of the population and organization of activities on liquidation of negative consequences of the use by the enemy of weapons of mass destruction. To perform these tasks are created in advance, equipped and prepared a special management bodies, units and establishments of MGO. The chiefs of medical services TH assigned, respectively, heads of health. In addition, by decision of the Executive committees of local Councils of deputies of workers in the cities, working settlements, enterprises, institutions, collective and state farms are created and completed on production principle, equipped and prepared for mass asset formation MGO. As part of MGO to provide medical care to the affected population in the centers of mass destruction have the following main movable formation: San. guards detachments San. squads (see Squad sanitary), peace operations (see a Detachment of the first medical aid), the emergency hospital (teams of specialized medical assistance), OSMP (units of specialized medical care), PEA (movable epidemic control units). The order of work of units of MGO is determined according to the adopted in the country the system of medical-evacuation provide the affected population with the specific situation in the centers of mass lesions, characterized by the value of sanitary losses (see Sanitary losses of troops), structure and severity of losses, contamination of territory by fires, debris, etc. MSGO performs its tasks in close cooperation with other services TH, when the current leadership from Headquarters DEFENSE. The most important activities of MGO are: medical-evacuation support (see), sanitary-hygienic and anti-epidemic provision (see), as well as implementation of special measures for protection from weapons of mass destruction (see Protection against weapons of mass destruction). The medical service of civil defense (MGO) included in the system of civil defense of the country. MSGO organizes and carries out during the war of treatment-and-prophylactic, anti-epidemic and sanitary-hygienic measures. All these activities aim to provide as soon as possible medical assistance to the affected population, to reduce mortality and disability among affected, for a quick recovery of their health and return to work, and to prevent the development of mass infectious diseases among the population, especially with the use of bacteriological weapons and poor sanitary conditions in nuclear and chemical lesions. Civil defense in the USSR is a system of national defence measures aimed at the protection of the population and objects of the national economy of weapons of mass destruction (nuclear, chemical and bacteriological). On civil defense shall have the following main tasks: a timely warning of the population about the threat of the enemy's attack and the attack; the organization of population protection from modern means of mass destruction (nuclear, chemical and bacteriological weapons); activities for ensuring the work of the most important objects of the national economy in case of the use by the enemy of weapons of mass destruction; organization of rescue and provide medical care to the affected population, and conducting emergency rescue and recovery operations in the affected areas. Civil defence is organized in all towns and rural areas of the country by the Soviet authorities. Heads of it are the chairmen of the Executive committees of the Soviets of working people's deputies. For immediate guide all the activities are organised by the headquarters of civil defense. An indispensable condition of the fulfillment of tasks assigned to civil defence is the preliminary preparation of the population and of all objects of a national economy. In the civil defense system includes special service, organized on the basis of various ministries and departments (communication, fire, policing and security, trade and catering, and others). One of the most important services is MSGO. The basis of organization and activity of MGO in wartime following principles: the organization on the basis of all existing medical and sanitary-epidemiological institutions irrespective of their departmental affiliation with attraction of the broad masses of the population; training of formations and institutions services for the organization of honey. providing the population with the use of any weapons of mass destruction (nuclear, chemical, bacteriological) separately and in various combinations; medical evacuation service is affected on the basis of a unified system of two stages honey. evacuation (first - in the most attacked the city and the second - in his suburban area); constant readiness for action, including at a sudden attack of the enemy, with a wide maneuver forces and resources in order intercity, interregional and interstate care; early adoption of measures for the protection and evacuation of medical personnel and medical institutions for maximum preservation of the forces and means of MSGO the attack of the enemy; widespread training of the population to the provision of self - and mutual aid. MSGO the USSR has in its structure: the governing bodies; a separate sanitary units and brigades; formation on the basis of medical and sanitary-epidemiological institutions (detachments of the first medical care, specialised medical care and movable epidemic); medical institution in the structure of hospital collectors in the suburban area of the cities of the likely targets of the enemy. In addition, a number of institutions, health authorities, existing in time of peace, used on their profile and in time of war (for example, stations and institutes of blood transfusion, sanitary-epidemiological station and others). Chiefs of MGO oblast (region), city and rural areas respectively are heads of oblast (regional) and city health departments, chief doctors of hospitals in rural areas. All chiefs of honey. the service is subject accordingly to the chiefs of civil defence of oblast (region), city and rural area. The management bodies are the headquarters of MGO organized with all the chiefs of the service. They carry out the daily work on the organization of the forces and facilities services, training all personnel services, all units and establishments, as well as provide operational management and control of forces and means service under the enemy's invasion and the appearance of lesions. At the organization of honey. provision of the population adopted the following types of aid: 1) first provided by the population itself in the manner of self-help and mutual aid, as well as sanitary units and personnel of other formations of civil defence services; 2) first medical rendered at the first stage, honey. the evacuation units of the first medical aid (OPM) and the forces partially preserved medical institutions; 3) specialized provided in the second stage, honey. evacuation in the suburban area in the profiled hospitals, members of the hospital collectors. Most mass formations MGO are sanitary brigade, organized at the industrial enterprises, in institutions, educational institutions, collective farms, state farms, railway and water transport from among the workers, employees, students. Their preparation is conducted by committees of red cross and red Crescent societies. Sandrina consists of 23 members: commander, a political officer, Svyaznoy (aka head. agriculture militias), 5 sanitary units (for 4 people). It is equipped with sanitary bags with dressing means and medicines, stretchers and means of individual protection. The main purpose of San. squads is providing first medical aid to victims in the centers of mass destruction, as well as organization of search and removal of the affected (typically, by rescue units of civil defence, organized from the population). Androgyny can also be used for loading and unloading affected by sanitary transport, to care for the affected hospitals and for sanitary and anti-epidemic measures. For convenience of management in large enterprises, in educational institutions and state farms, which offers several San. detachments of them are units (consisting of 3-4 teams). The volume of the first medical aid rendered by Sandrine (units): the imposition of a primary dressing on wounds and burns; a temporary stop bleeding by means of a pressure bandage, harness ("spin"); immobilization extremity bone fractures and extensive lesions of the soft tissues; the simplest protivosokovh activities (calm, warm, injections of morphine and other); artificial respiration; the correct laying on the stretcher; putting on a gas mask and the Lodge inside or introduction using a syringe-tubes antidotes, leather processing and service with the help of individual chemical package (in chemical lesion). Providing first medical aid is combined with sorting, which is reduced to the solution of the question about the order of rendering assistance and carrying out of the squad first medical aid. In bacteriological the lesion San. teams are invited to identify patients by the household crawls, sanitary processing, disinfection measures and implementation of emergency prevention among the population that had been attacked. A detachment of the first medical aid (OPM) is the main moving formation of MGO for rendering first medical aid in the lesion. Its main tasks: organization in the lesions of rendering first medical aid to victims forces San. teams; the deployment of medical center, which is the first stage of honey. the evacuation, which made the admission affected, their honey. sorting, rendering of the first medical and qualified assistance on condition of life, and hospitalization nontransportable; dosimetric control, partial sanitary treatment and decontamination of clothing and footwear affected; preparation amazed to evacuate in a rustic area, on the second stage of honey. evacuation and loading them on sanitary transport; medical supply their units and attached sanitary teams. For OPM installed model the number of staff in 144 people, including 8 doctors, 38 secondary health care workers (nurses)and 3 of political worker, 72 aide (including two attached San. militias) and 23 attendants. The number of the detachment of may vary depending on the number of physicians and other medical staff, available in a medical institution, on the basis of which is formed squad. The organizational structure of peacekeeping operations presented in Fig. 1. OPM has a personnel honey. and sanitary-household property, as well as the moving power plant and vehicles. Fig. 1. The organizational structure of the OPM. The first volume of medical assistance rendered in peace operations: a review and honey. sorting to determine the order and nature of medical care, the need and priorities of the further evacuation in the profiled hospital suburban areas; padding honey. card of the primary account at all left in OIIM and evacuated affected; introduction on the testimony of tetanus toxoid; application for the prevention of antibiotics; protivosokovh activities (warm, transfusion of blood or blood fluids, the use of stimulant of the nervous and cardiovascular systems); final stop bleeding; the imposition and fixing of bandages in wounds; immobilization of the limbs; the restoration of respiratory function (artificial respiration, giving oxygen); surgical intervention for health reasons (tracheotomy, laparotomy, decompression trepanation and others). Depending on the situation (income affected, including mostly walking or stretcher, the number of personnel of radiation situation) the amount of assistance may vary. The second stage honey. evacuation hospital is the base deployed on escape routes from the city - possible object of the enemy's attack. Hospital base (B B) - a set of short (5-7) hospital collectors. The structure of each collector is usually multi-profile hospital Association, consisting of several peer hospital - burn, traumatology, neurosurgery (or are affected by injuries to the skull, spinal, ear, throat, nose, eyes and jaw), thoracoabdominal (including impressed with urological and gynaecological damages), to the affected hip and large joints, therapeutic (including for patients with radiation sickness). For the reception and treatment easily affected, in each hospital collector provides for the collection point easily impressed (PSLP) from hospital on 50 beds. Each hospital collector, typically deployed within the same administrative area. In each hospital manifold provided the parent hospital, usually organized on the basis of the Central district hospitals in peacetime. The main purpose of this hospital is a management training, deployment, and medical activities of all hospitals included in a hospital collector; honey. sorting amazed at specially organized sorting space in the composition of the head of the hospital or on the basis of the nearest to the home defeat hospital with the subsequent direction of the affected hospitals profile; receiving the most seriously affected, which may not follow in the profiled hospitals; organization honey. procurement and supply of blood and blood substitutes hospitals included in this hospital collector. 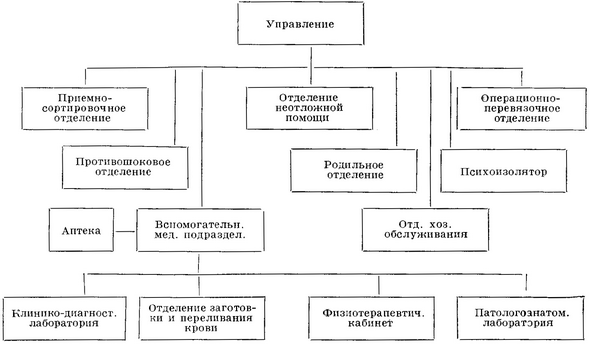 The organizational structure of the head of the hospital are presented in Fig. 2. Organization of the specialized medical aid in hospital manifolds is ensured by giving hospitals teams of specialized medical assistance. In peacetime, on the basis of all clinical and other major hospitals, medical institutes, institutes of advanced training of doctors and specialized research and clinical institutions are organized groups and individual teams of specialized medical assistance. The squad consists of 14 (or more) teams of specialized care, including doctors, nurses and special honey. property. The detachment can be brigade: screening, surgery, traumatology, neurosurgery, thoracoabdominal, burn, ophthalmic, oral, otorhinolaryngological, toxic therapy, infectious, radiology, gynecology, radiology, psychoneurological, blood transfusion, anesthesia, and other. By the order of the respective chiefs of MGO teams of specialized medical assistance given profiled hospitals, where they organize a specialized medical assistance and make the necessary surgical intervention on his specialty. Fig. 2. The organizational structure of the head of the hospital. In the evacuation of the peace operation in the hospital database provides one or more honey. distribution points (MCI), which is charged with the direction of vehicles impressed with the hospital reservoirs, taking into account their total bed capacity. At MCI vehicles are not delayed and is only General accounting affected directed at a particular hospital collector. On the border of hospital collectors on the roads exhibited auxiliary distribution points (GRP)that direct transport from the disease, intended for a given reservoir, on the sorting area of his head to the hospital, where mesotherapy then sending affected by assignment to the appropriate profiled hospital. General management training, deployment and therapeutic activity of medical databases manages hospital facilities (UBB). In the General system of MGO are important measures for the protection of patients and medical staff from radiation damages and losses of chemical and bacteriological weapons. To do this use of individual and collective protection means (see Antiradiation protection, Sanitary-chemical protection). Special instructions provide for the organization in units and establishments of MGO of measures on anti-chemical, anti-radiation and antibacterial protection. Cm. also Medical-evacuation support.